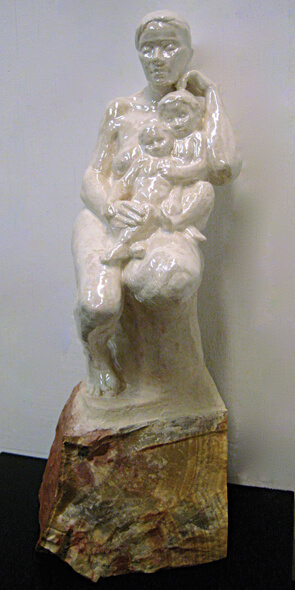 Dionisio Cimarelli, Child, 1993, chestnut wood, 25 1/10 inches (h). The course provides students with an advanced traditional skill of carving wood and creating figurative or abstracts forms. Students explore carving/construction using different type of wood. Studio practice, investigation of historical/contemporary methods/concepts, and development of personal sculptural imaginary are explored. The course will focus on Italian and European techniques; the special ways in which sculptors in Italy have developed over centuries of carving wood and understanding the characteristics of different materials. 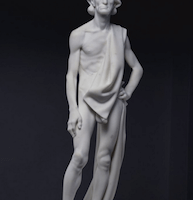 A number of techniques, and attention to different expressions of old and contemporary sculptors will also will be discussed. It is mandatory to have a maquette before you start carving the wood. Students in this class create work without using life model. For interested students, use of the point machine is also introduced. Dionisio Cimarelli boasts wide international experience and is one of the most well-known Italian sculptors who exercised, for about nine years, his artistic activity in China. Born in Jesi at Ancona Province in Italy, he holds a Diploma in Sculpture from the Academy of Fine Arts of Carrara. He also studied at the Repin Institute of Arts (St. Petersburg, Russia) and at the Academy of Fine Arts (Prague, Czech Republic). He participated in restoration projects at the Louvre Museum (Paris), the Royal Church (Copenhagen), the Royal Palace in (Stockholm), and at Strasbourg Cathedral (Strasbourg). He has received important scholarships from such organizations as the National Sculpture Society and the New York Art Academy (both in New York City). He has been invited as guest professor at the Wimbledon School of Art (London) and at King Saud University (Riyadh, Saudi Arabia). He has also participated in several conferences at prestigious academic international institutions. He held a solo exhibition at Berlin Philharmonic (Berlin) at the invitation of world-renowned Maestro Claudio Abbado. While in China, Mr. Cimarelli exhibited in the International Art Biennale (Beijing), the International Sculpture Biennial (Shanghai), and at MOCA Museum (Shanghai). From 2007 to 2012, he was the art supervisor of the important architecture project ZhongKai SheShan Luxury Villas of Shanghai. From 2010 to 2012, he was a member of the editing committee of China Sculpture Magazine. For the Shanghai World EXPO 2010, he was commissioned to create the sculpture of Matteo Ricci for the Italy Pavilion. This sculpture is currently in the collection of the Regione Marche Government (Ancona, Italy). In 2011, he participated in the Venice Biennale. In 2013, he moved to Monterey, California for a year to act as creative director of a large sculpture studio. In 2014, the U.S. granted him permanent residence via the EB-1 Extraordinary Ability. Currently he is also teaching sculpture at the New York Academy of Art, as part of their MFA curriculum. He has been represented by the following medias: CCTV , Shanghai TV, RAI 3, CNBC Italy, Oriental TV, New Haven University Radio, CUNY TV, SinoVision TV, and RAI Italia. He has been written about in Panorama, Rai International, Arab News, Al-Jazirah, LIFE Magazine, Domus China, China Daily, Liberation Daily, China Sculpture Magazine, Casa & Design, Shanghai Daily, LIFE & PEOPLE, and La Voce di New York. Read this interview with China Daily. “Very structured. Very professional. High level of instruction. I learn tremendously from Dionisio.